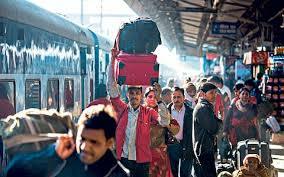 Since childhood i used to love watching fast trains. As they used to shatter stations with their speed especially the one who are not stopping on your platform. I used to drool over that trains. Wherever I was, I used to spend a minute just to see how fast the trains is moving. This use to motivate me and make me feel happy. If your train is late you get frustrate for while but then when you look around you get occupied. There are so may people , Some who are travelers , some have come to receive ,some have come to say see off. On your one side you will feel people who have come to receive their loved ones ,as soon as they see their guests they get over whelmed followed by hugs and blessings. Laughter joy and happiness prevails among them. As soon as you just feel the joy and love the other end you see some are seeing off their guests with tears in eyes. How many of you cry when you see off your parents? I think many of us but tears just don’t roll off eyes but ya some where heart cries. And your heart pounds with the feeling of separation.In India at the time of departure your loved ones bless you with envelopes filled with money and joy. That moment when you elder ones gives you money and hesitate taking it but still they give you with so much of love. This moment is so touching and you start thinking ,this is such a beautiful ritual. This feeling gives you a lump in your throat. The other people will just run and board train.They are running late but somehow board the train and the expression on their face is just victorious. It seems he has the world. Train takes you the adventurous and emotional ride. It takes you the bumpy ride.The stalls, smell of delicacy and tea just makes you strong enough to wait for your train. Even hours in the train you can run stand play games. There is no requisite of sitting fastening your seat belt. You are free to lay down. Out of several modes of transport ,travel by train is very exciting and always lead to interesting stories.We even come across several love stories which started in train.Travel by train is cheap ,affordable ,and comfortable. With the Bullet train venturing in India, the railways is gearing up for exciting rides.